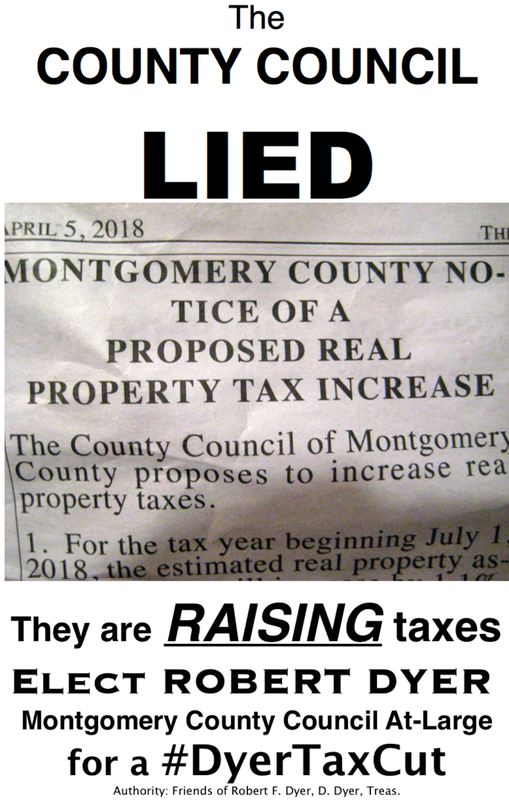 Remember when I reported that the Montgomery County Council would raise property taxes again this year, despite elected officials' and the local media's claims otherwise? More proof is in. 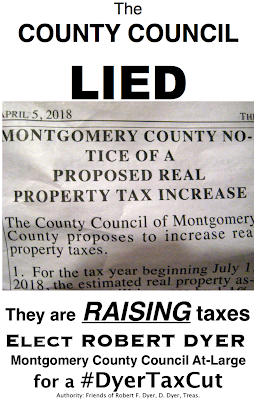 Here is the announcement the County Council is required to print in local newspapers before they can raise your taxes, and it reads, "The County Council of Montgomery County proposes to increase property taxes." It also details what I had explained: The County's tax scheme deviously increases taxes automatically each year, in an attempt to trick the public into thinking the Council had nothing to do with it. In fact, as the announcement notes, in order to avoid the automatic tax increase, the Council would have to "reduce its real property tax rate enough to fully offset increasing assessments. The proposed budget does not provide such a reduction. instead of the corrupt County Council's! Hence your tax rate for FY-2019 will be 4.1% higher, and the Council will steal an estimated $56,120,926 from their constituents' bank accounts in the coming year, on top of what you payed last year. The Council's historic 2016 8.7% tax hike walloped many County homeowners at effective 9%-10% rates based on their rising home assessments. Councilmembers had falsely claimed the increase was for "education," but student performance and graduation rates have actually continued to decline after the tax hike, as they have throughout the decade. If you re-elect Helpless Hans Riemer and 3 new equally-controlled At-Large candidates chosen by the MoCo political cartel, wait until you see the tax increase you'll get in 2019, 2020, etc. A better choice would be to vote for Robert Dyer, who will offer a #DyerTaxCut, repealing the 2016 property tax and 2010 energy tax hikes incrementally over 4 years. Riemer's own former chief of staff recently noted that the energy tax hike appeared to have a devastating effect on the net number of new businesses created in Montgomery County this decade. MoCo had a net increase of only 6 new businesses, while D.C. and Fairfax enjoyed a net addition of 3000 new businesses each. Either you're dumb or you think your readers are dumb. The tax rate isn't going up at all - the tax receipts are what's going up (from new construction and from rising property values). It's called growth. It's a good thing in, literally, everyone's eyes except yours. This is why no one in their right mind will vote for you. You failed to read the text shown in the photos - it clearly states that if the Council fails to reduce property taxes by the specified amount, they will automatically increase. So, for the Council to fulfill their promise not to raise property taxes, they would have to reduce taxes by that amount. The text just as clearly states that the Council has chosen to not offer that reduction, and therefore property taxes will rise by the amount specified. Are you illiterate? Unable to read the low-reading level text, and yet you call others "dumb." People will vote for me because, unlike the current County Council, I'm telling the truth about taxes. Again, the property tax rate is not going up. Property tax receipts are what's going up. It's a good thing that new construction yields additional tax revenue. It's a good thing that property values are increasing. The alternative is economic decline. The fact I have to explain basic economics to you is disheartening. Again, read the text of the announcement. I've made it so easy for you. "Proposed Real Property Tax Increase." The fact that you can't read 3rd grade-level English is indeed "disheartening." The alternative to tax increases is economic growth. Moribund MoCo hasn't had much of that. Just tax hikes. Tax hikes are "a good thing?" LOL - Tax hikes are what got your bosses on the Council term-limited. "The alternative to tax increases is economic growth." You're literally describing what happened. How do you not get that? Why are you not grasping the very obvious difference between a tax rate increase and a tax receipt increase? This honestly could not be simpler. The fact you think tax receipts going up is a negative makes you appear unimaginably obtuse. 2:46: Hey dumbass, the text announcing the tax increase is right in the photos above. This honestly could not be simpler. The fact you think taxes going up is a positive makes you appear unimaginably obtuse. Montgomery County has NOT had economic growth, as all of the statistics from government sources prove. Too many tax hikes, and too many stupid people like you elected to the Council. Of course tax receipts going up is a good thing. It's called growth. Imagine what the budget would look like if county population was increasing and county tax receipts weren't. Maybe take an econ class instead of running yet another failed campaign. 3:26: Wrong again - what you suggest we should "imagine" is actually happening right now - population IS increasing, and county tax receipts AREN'T. As a result, we have a $208,000,000 deficit. Maybe read up on the County's finances instead of running yet another troll attack. The notice clearly states: First, that if the tax rates stay the same as last year, revenues would increase by ~$15M. In other words, this is solely due to an increase in assessments...not a tax increase. Therefore, they would need to reduce the tax rate in order to maintain the same revenue levels as last year (which would never happen). It then goes on to say that on top of that, the council is "considering" increasing (READ: WILL INCREASE) the tax rate to $0.7704 per $100 (last year's rate was $0.7484 PER $100). Dyer appears to be right here. Want to buy a Chinese supermarket?